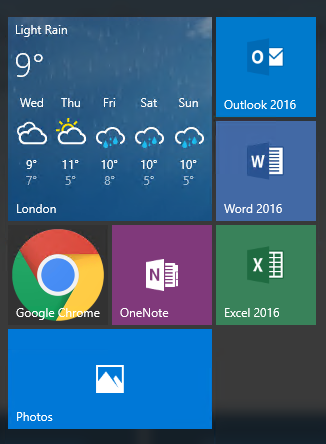 I don’t have a problem with the user customising their own start menu, but I want them to start with a relatively clean slate. Microsoft, of course, have you covered on this one. 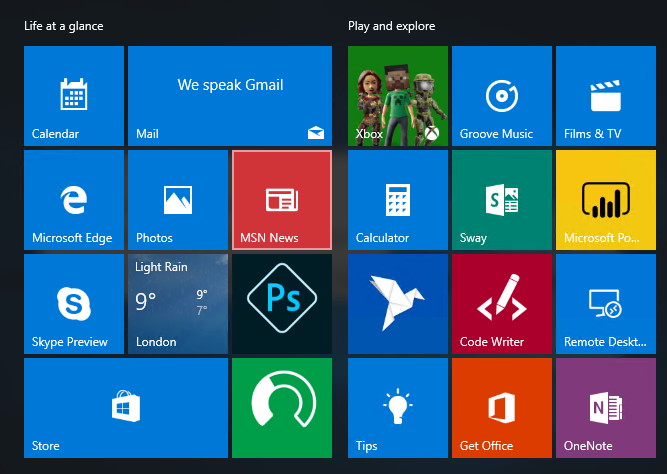 You need to customise your start menu as you see fit. Then you can use a PowerShell command to export that layout to an xml file. 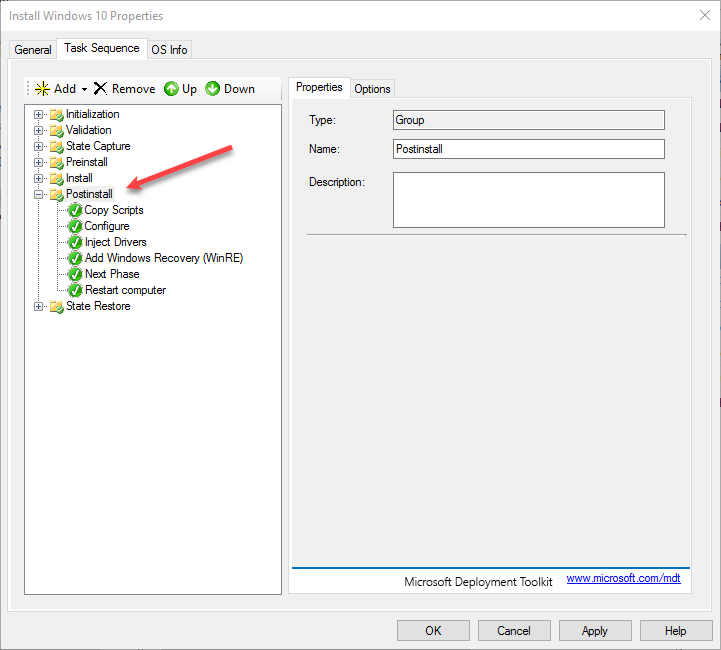 So, to do this you will need a reference PC, which can be any Windows 10 machine. Here is my customised layout. Just be aware when creating your layout, that any App not on the System when deployed may leave an empty space. Keep the file name as LayoutModification.xml as it is the file name Windows looks for. Now that we have our XML file, we can use this as part of a Task Sequence to add it to our Computer during Deployment. Copy the XML file into this folder. Also, create a new text file, called ‘CustomStartMenu.cmd’, don’t forget to remove the ‘.txt’ at the end of the file name. This will copy our custom XML to the Default Users profile on our new computer. 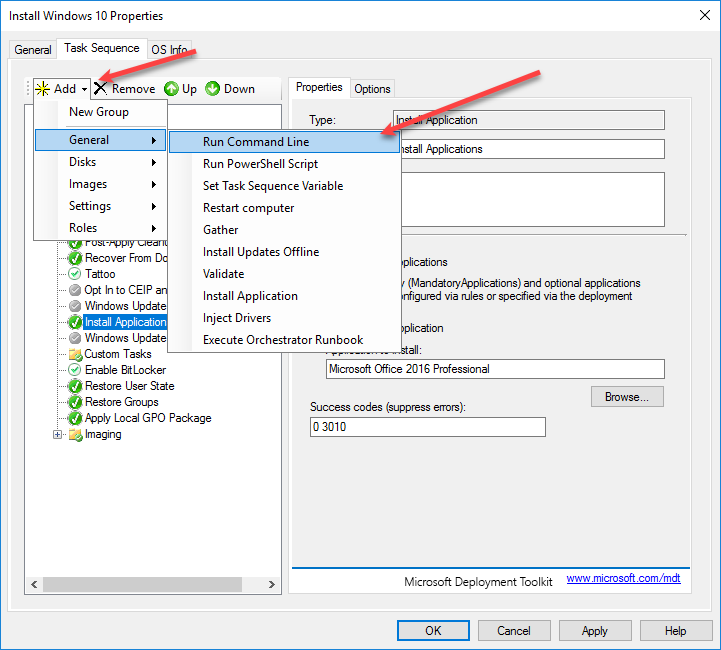 Now go into MDT and Edit your Windows 10 Task Sequence. Find the PostInstall phase and expand it. Select Add, General, Run Command Line. Use the Up arrow to make sure it is above Restart Computer. 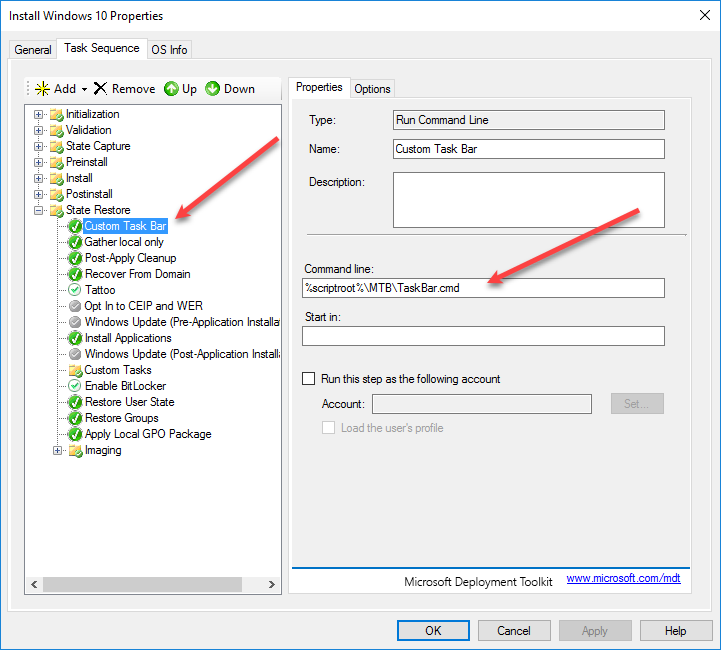 This tells MDT to run our CustomStartMenu.cmd file during the post install phase, which is still during the WinPE phase of installation, which is why we copy the XML to D: and not C:. 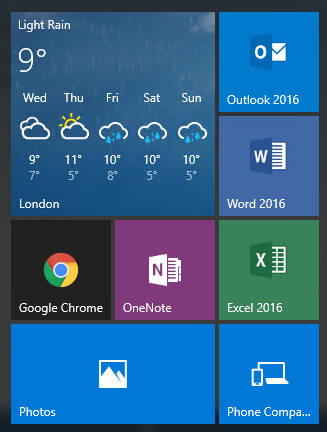 Now when our Windows 10 machine is deployed all users will start with our customised Start Menu. Whilst searching for a similar method to control the TaskBar, I came across this solution. Unfortunately I couldn’t make this work with a Task Sequence completely. 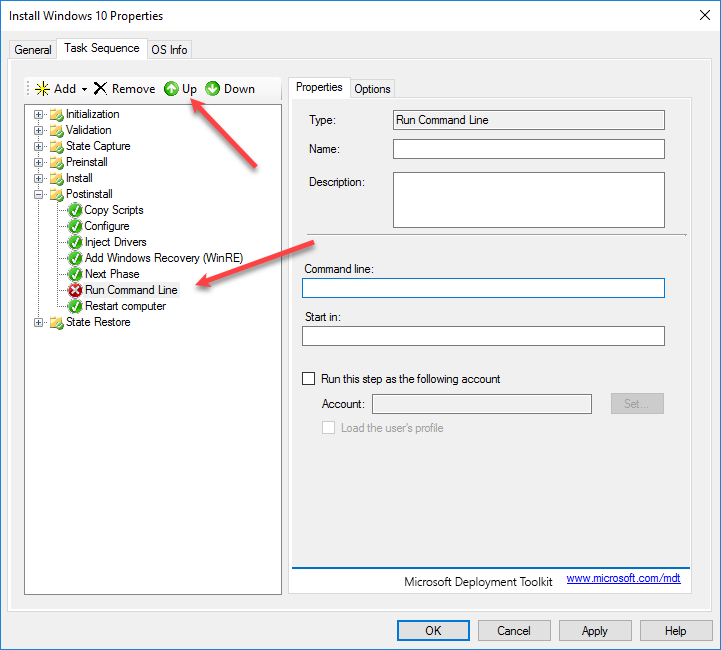 We can copy the required files to the computer, but I haven’t been successful in kicking it off automatically at the initial logon of a new user account. It is entirely possible am doing something wrong. What I decided to do instead, was create a Task Sequence entry to copy the files from the MDT server to the C:\Windows folder, and then I used a Group Policy to run the Taskband.ps1 file at logon. On my reference machine I configured the Task Bar as I liked it, then followed the article to export the relevant files and registry keys. In my Deployment Share I created an MTB folder. 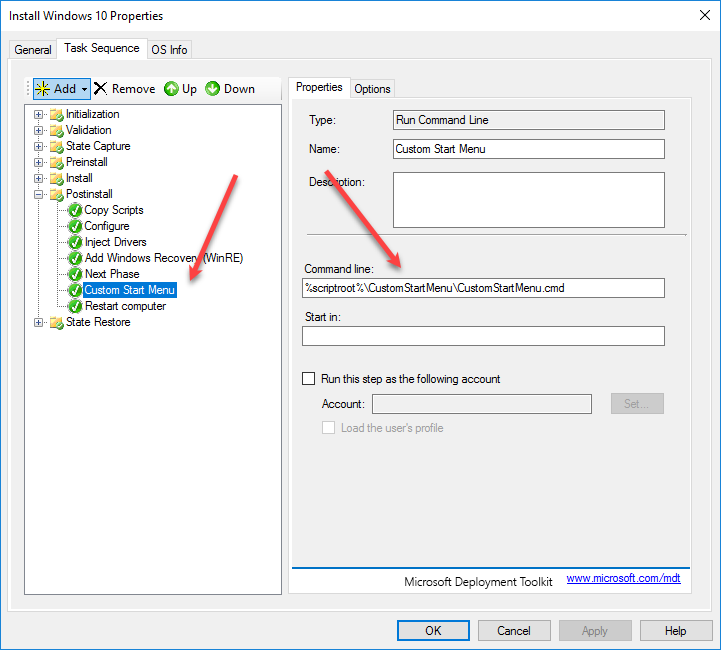 The last thing I want to cover in Part 6 is how we can further customise our Task Sequence based on the hardware of the client device. Yeah, Looks great. But my WDT/WDS deployment has been hung on “Running Action: Custom Start Menu” for 20 minutes now. When it does boot, it also wont skip the OOBE and doesn’t finish running the Litetouch scripts. Followed your steps, this is what I get. Thought? What happens if you disable that step? Checked any logs? I am also having the same issue. During the task sequence to insert your custome start menu it will hang. Did you guys found a solution?